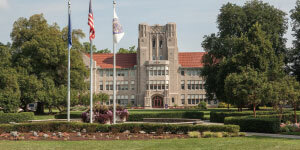 The University of Evansville is a private, fully accredited liberal arts–based university with programs in the arts and sciences and in the professions. UE offers more than 80 different majors and areas of study. Affiliated with the United Methodist Church, UE shares the church’s commitment to inclusiveness. At the University of Evansville, you will find a warm, welcoming community that appreciates and celebrates diversity. The 2,002 students currently enrolled at UE represent 57 countries and 45 states. UE students enjoy a rich on-campus experience through Greek life and other student organizations and events, community service opportunities, and leadership development programs. Off campus, the city of Evansville and the surrounding area offers such attractions as locally owned restaurants, museums, zoos, nature preserves, and amusement parks. Evansville is only three hours from St. Louis and Indianapolis, and two from Nashville and Louisville. The majority of UE students study abroad—many spend a semester or summer at Harlaxton College, UE’s living-learning center in Grantham, England. Housed in a 100-room Victorian manor house set in the English countryside, Harlaxton is only one hour north of London, and students often travel throughout the UK and Europe on weekends, engaging the people, culture, and history. Other study abroad locations include such countries as Australia, France, Israel, Italy, Mexico, the Netherlands, New Zealand, Russia, and Spain. Each UE student experiences a unique curriculum and a challenging atmosphere with hands-on projects and high-quality teaching. Faculty members, passionate about teaching, prepare students for success in whatever directions their careers take them. The student-faculty ratio at UE is 10:1, and the average class size is 17 students. In today’s world, new career paths are opening up, and existing jobs demand higher levels of skills and knowledge. UE prepares its graduates to be career ready as they begin their professional journeys. UE students participate in undergraduate research, professional practicums, and internships. They have access to real-world, cutting-edge equipment and techniques in specialized areas such as the UE Nursing department’s simulation lab. The University offers new programs and majors relevant to today’s job market in the areas of Data Science, Ethics and Social Change, Logistics and Supply Chain Management, Spanish Medical Terminology, and University Studies. View guidelines and more information about the UE Guarantee online at evansville.edu/guarantee.